It’s quite difficult for me to choose a favorite horror-comedy because I have such a love for the sub-genre. There is something special about the grotesque being met with a sense of humor, especially when it’s done well. When all is said and done there is a film at the very top of my list that is closest to my heart, Brian De Palma’s Phantom of the Paradise. 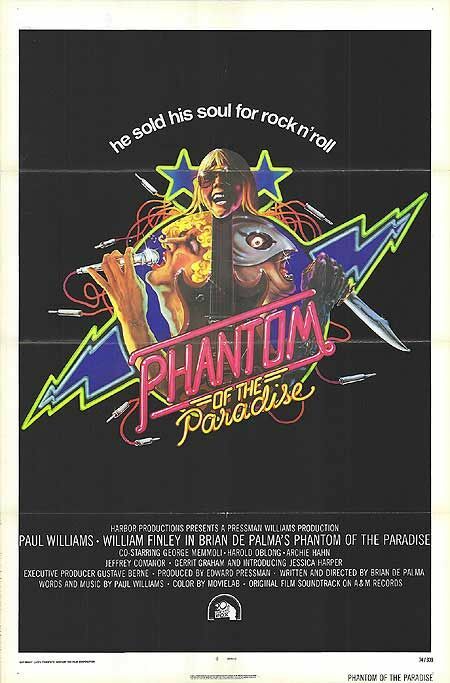 Normally I find musicals quite irritating when they break for a musical number but in Phantom of the Paradise Paul Williams’ songs are well written and magically performed by William Finley and Jessica Harper. A musical spoof/rock-opera of Phantom of the Opera/Faust, Phantom of the Paradise centers around a struggling musician named Winslow (Finley) who decides to sell his soul for his music, more specifically, for his music to be performed by the perfect woman with the perfect voice, Phoenix (Harper). Winslow is disfigured and double-crossed thanks to Swan, an evil record producer played perfectly by Paul Williams. Swan is planning to debut his new nightclub, The Paradise, with the music composed by Winslow/The Phantom but it will not be performed by Phoenix, it’s set to be performed by a musician named Beef who Swan has deemed more fitting. The Phantom is then set on exacting his revenge for the voice, the woman and the music he loves. While Brian De Palma has written a brilliant, entertaining and wonderful film I don’t think it would have been as great without the music written by Paul Williams. The songs “Hell of It” (performed by Paul Williams) and “Faust” (performed by William Finley) are two of my favorite songs of all time, not just songs off of a soundtrack. The film was cast perfectly as well, Jessica Harper was recognized by Dario Argento thanks to Phantom and was cast in the well-deserved role as Suzy Bannion in his masterpiece, Suspiria 3 years later. While William Finley appeared in other De Palma films (most notably, Sisters) this was his biggest role and by far, by far, by far his best. Comedies often add a lighthearted feel to a film but while the satirical elements and Gerrit Graham’s portrayal of Beef were the most comedic layers there was nothing lighthearted about Phantom of the Paradise. I attribute this mostly to William Finley’s performance as Winslow Leach, he grabs onto your heart while performing “Faust” in the beginning of the movie and doesn’t let go, even after the film ends.